First, make the marinade for the chicken: Combine the olive oil, lime juice, cumin, salt, pepper, chipotle peppers and garlic in a blender and mix until totally pureed. Pour into a large resealable plastic bag with the chicken breasts. Seal the bag, smush it around to coat the chicken and place it in the fridge to marinate for at least 4 hours (overnight if possible). After the chicken has marinated, roast the poblano chiles one-by-one over the flame of your stovetop, using metal tongs to hold them, until the skin is totally charred. (If you don't have a gas stove, you can use an outdoor grill OR place them on a baking sheet directly under your oven's broiler.) When the skin is totally blackened, place the chiles in a large resealable plastic bag and seal the bag to allow the chiles to sweat for a good 20 minutes. Remove the chiles and use a knife to scrape off most of the blackened skin. Slice the chiles in half lengthwise, and scrape out the seeds and membranes. Lay out the chile halves so they'll be ready for the next step. Preheat a grill pan to medium-high heat (or use a skillet). Grill the chicken (or saute in the skillet) for 4 minutes on the first side. 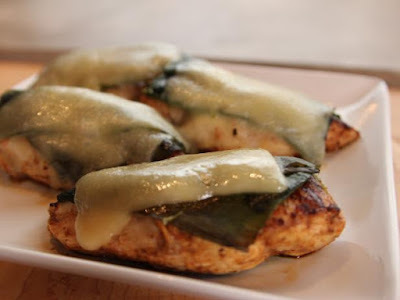 Turn the chicken over and lay 2 chile halves and a nice slice of cheese on the cooked side of each piece. Turn the heat to medium low and allow the chicken to finish cooking until it's totally done in the center, 4 to 5 minutes. The cheese should melt on its own; if it needs a little help, invert an iron skillet over it (or put the lid on the skillet, if using). Serve! 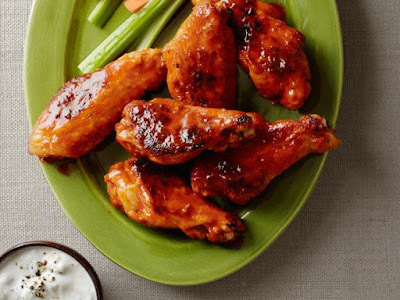 You can also use any marinade you'd like, homemade or store-bought, for the chicken! Anything works. 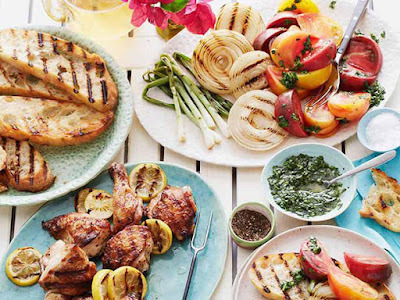 Served with grilled scallions and onions, thickly sliced heirloom tomatoes and charred lemon slices, Scott Conant's juicy grilled chicken is perfect for a summer cookout. Combine 1 cup of the olive oil, the Worcestershire, red pepper flakes, onions, scallions and lemons in a large bowl or large zip-top bag. Add the chicken pieces and toss to coat. Marinate in the refrigerator for at least a few hours. Prepare the coals on an outdoor grill to medium hot or heat a gas grill. If using coals, bank them to one side of the grill so that one side is hot and the other less so. Remove the chicken and vegetables from the marinade and transfer to 2 baking sheets. Discard the marinade. Sprinkle the chicken pieces well with salt and pepper and then place the chicken, onions, scallions and lemons onto the grill. You may lose some scallions or lemons, but hopefully most won't fall through the grates! Put the cover on the grill to increase the heat and cook the hell out of the chicken. The grill will smoke like crazy, but try to resist opening the lid for 7 minutes or so. Open the lid, flip the chicken and continue cooking, mostly covered, until the chicken is cooked through, about 35 minutes total. If the chicken, lemon and onions are getting too charred, reduce the heat or move them to a cooler part of the grill, flipping as needed. Remove from the grill and let rest for 5 to 10 minutes before serving. Meanwhile, mix together the remaining 1/4 cup olive oil, the parsley, vinegar and anchovies, if using. To serve, brush the bread with olive oil and grill on both sides. Divide the chicken, lemon, scallions and onions among serving plates. Place the tomato wedges alongside and drizzle with the vinaigrette. Serve with the grilled bread. This high-protein, whole-grain dish is easy to throw together. 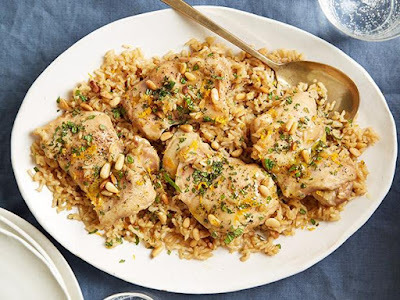 We love using chicken thighs, because they're budget friendly and stay moist while baking with the rice. Preheat the oven to 375 degrees F. Heat 1 tablespoon of the oil in a large nonstick skillet over medium-high heat. Add the onions and cook, stirring, until just beginning to brown and soft, about 5 minutes. Add the onions, chicken broth, rice, 1/4 cup of the orange juice, 2 teaspoons of the orange zest, 1 tablespoon of oil and 3/4 teaspoon salt to a 2-quart baking dish and stir to combine. 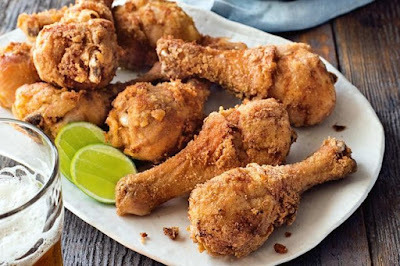 Toss the chicken with the remaining 1 tablespoon oil, 1/4 teaspoon salt and 1/4 teaspoon pepper in a medium bowl. Nestle the chicken into the rice mixture. Cover the dish with foil and transfer it to the oven, being careful not to spill. Bake for 55 minutes. Remove the foil and drizzle the chicken with 2 tablespoons of the orange juice. Continue to bake until most of the liquid has been absorbed, the chicken is fully cooked and the rice is tender, about 50 minutes more. Drizzle the chicken with the remaining orange juice. Sprinkle the mint, pine nuts and desired amount of remaining orange zest over the dish and serve. Clean chicken, rinse with cold water and pat dry. Season with salt and pepper. Heat 1/3-cup olive oil in a large heavy skillet over medium-high heat. When oil is hot, carefully place chicken in pan using tongs. Breasts and thighs first, then the rest. Brown well on all sides, remove chicken from pan. Pour off all but a few tablespoons of oil. 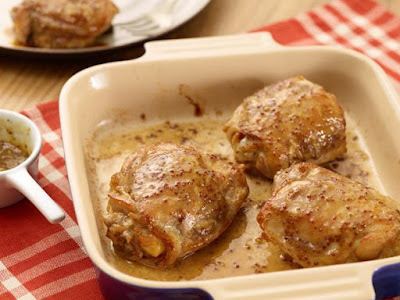 Return chicken to skillet and place uncovered in preheated oven for 25 minutes, turning chicken once or twice. Heat 2 cups of canola oil to 350 degrees F.
While chicken is cooking have potatoes peeled, wedged, rinsed and dry. Carefully add wedges into hot oil, about 4 at a time. Avoid crowding. Fry potatoes until golden and remove and let drain on paper towel and reserve for later. For the last 5 minutes of cooking for the chicken, add the cooked potatoes, garlic, oregano and wine to skillet, return to oven. Remove skillet from oven to stove top after the 5 minutes, add parsley and gently turn with a spoon. 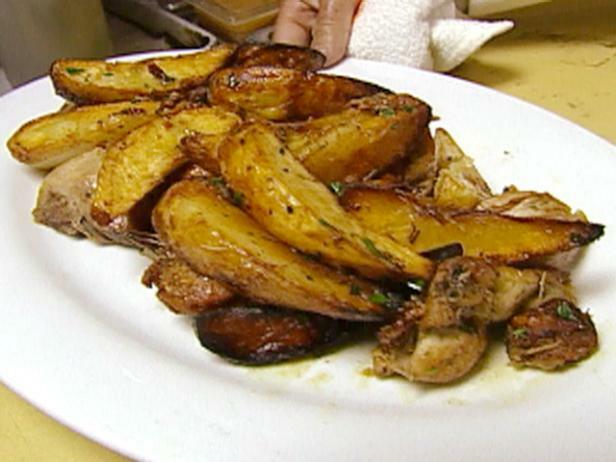 Remove chicken to a large platter, arrange potatoes atop the chicken and pour the pan juices over all.